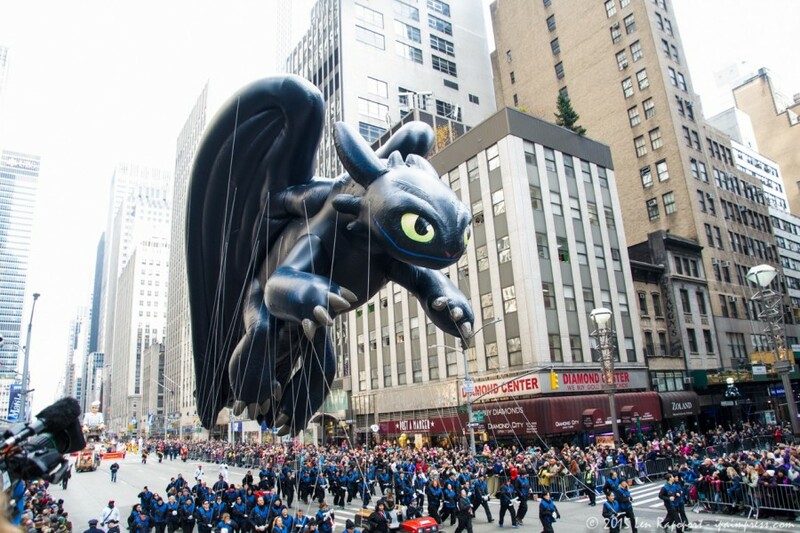 As my readers know I cover a number of parades in New York and decided I would take a shot at covering the Macy’s Thanksgiving Day Parade this year. I was concerned about the number of people there and with the recent terrorist attacks concerned for my safety. 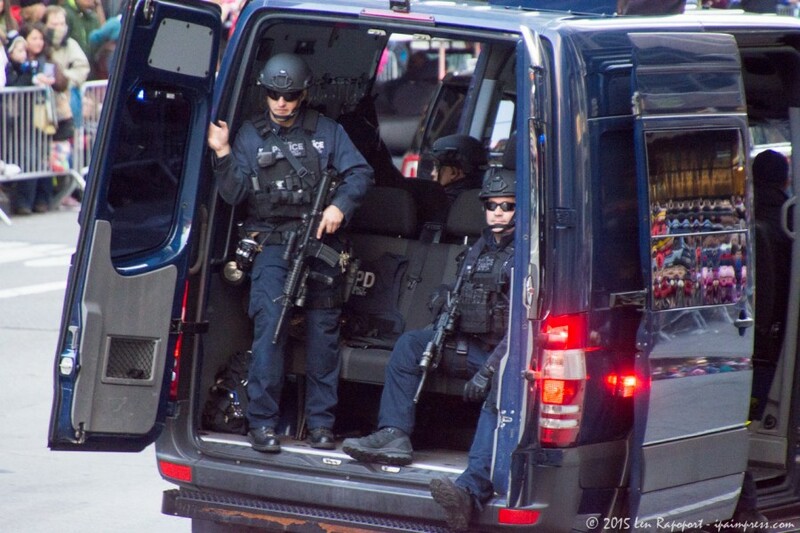 Both of these concerns were unfounded and it turned out to be a great day, beautiful weather, incredible security by the New York Police Department and an orderly and happy group of hundreds of thousands of spectators. We were told to arrive no later than 7:30 AM and we left our home in New Jersey at 6:00 AM. Arrived in the city with very light traffic since most listened to the advice to take public transportation. 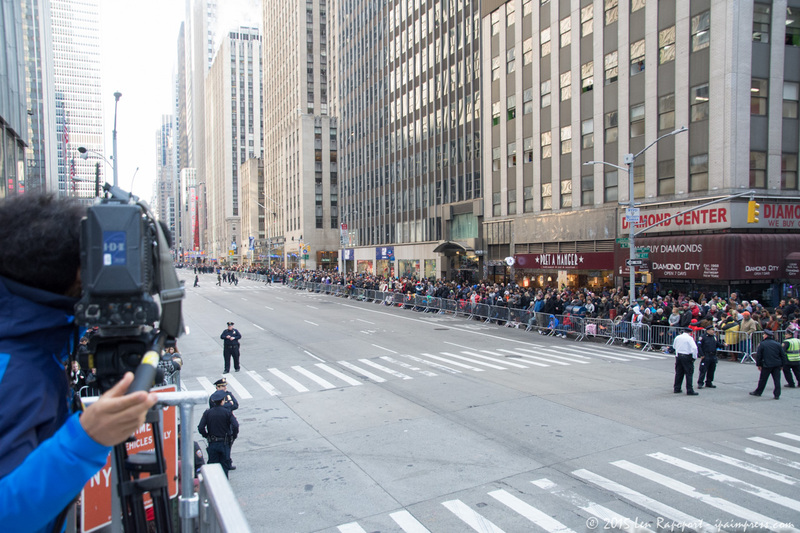 I was able to park in a Press Parking space off the corner of 47th Street and 6th Ave. a perfect spot to cover the parade. 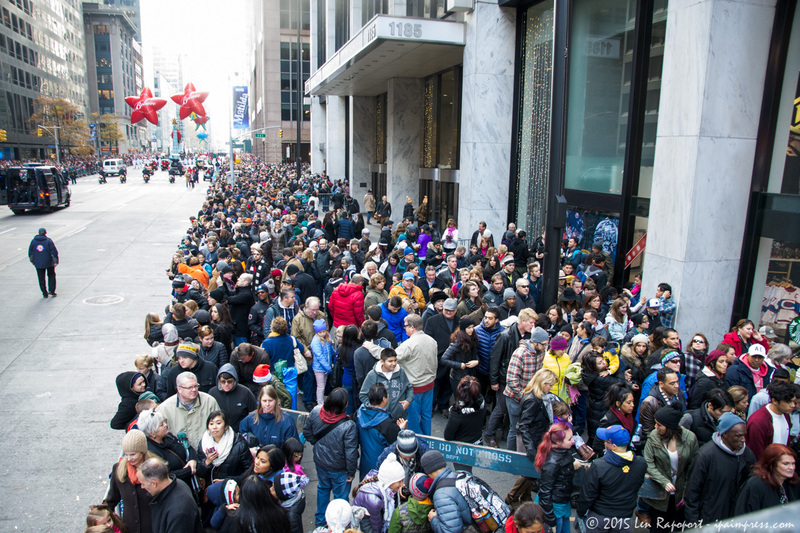 I was prepared to get my gear and get into the street and shoot the parade as I have done at others…but…I noticed Macy’s constructed a tower that was erected to accommodate the foreign press who did not have NYPD Press ID. After identifying who I was I was allowed me to shoot there as well. Unfortunately, I wasn’t able to get down from the platform until the parade was over and people began to leave. As you can see in my photos it was wall to wall people and I would have loved to get in the street to get those close up and personal shots of the participants as I have at other parades. The parade started at 9 AM from the 77th Street launch. At 9:30 AM it reached 47th Street and I began to snap away. I had previously recorded our correspondent Andy Peeke’s intro so we were ready to shoot the parade. Using one camera was a bit of a challenge as I changed from one setting for video to the other for my still shots, but I was able to get the entire parade on video and over 300 beautiful photos. 19 Floats, 9 were newly introduced at the parade this year. 2 Balloonicles – not sure that word means, but you will see the Kool Aid Man, that is a balloonicle. 11 Novelty Balloons, these are the non-character balloons you will see. These included Macy’s Yellow Stars, Macy’s Red Believe Stars, Pumpkins, Happy Hippo, Harold the Fireman, Wiggleworm, Arrtle the Pirate and others. There were 29 groups of clowns that you will see in the video and 12 marching bands from High Schools and Colleges in addition to the New York Police Marching Band and Macy’s Great American Marching Band. 6 Great Performer Groups to include an amazing number of cheer leaders in the Spirit of America Cheer and dancers in the Spirit of America Dance Stars. Last but not least, the “Notable Performers” who perform for the NBC cameras at Macy’s Herald Square. They were on the floats waving to the screaming crowds, but the didn’t perform. I expected them to at least mouth some of the songs to recorded music as they passed, but alas, that is probably a contractual deal with NBC so no other media outlet could record it. The parades final float is Santa’s Sleigh with the real Santa and Mrs. Clause. 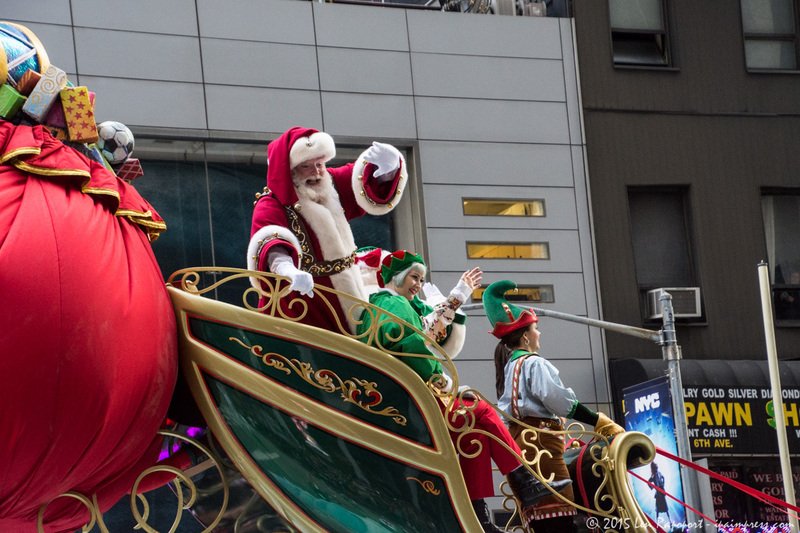 I still get excited to see them high on top of their sleigh waving to the millions that know this is the start of the Christmas season. I think I still believe in Santa Clause too. 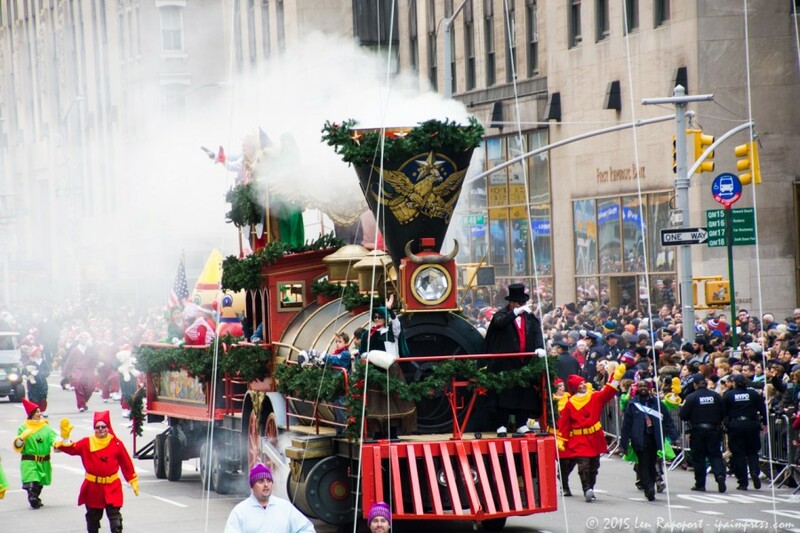 Macy’s has a wonderful parade website with all the information including everything we saw at the parade and more. No need to write about it here, just click here to visit their parade website. Watch our video. it will cover the entire parade in only 30 minutes. I have identified every balloon, float, band and group at the parade. I have added some musical tracks to the video so you won’t have to listen to the screaming crowd and I shot it all in gorgeous HD video. You may download any for your personal use. These are copyrighted photos and should not be used on a website or for publication without my permission. Click Here or the image below to see the entire album. I like to include a list of equipment I used to cover my events and the software used to process the finished product to help other photographers and videographer’s so they can do the same. It also gives me an opportunity to thank these companies for their continued support. Always back extra batteries for camera and lights and remember to take extra memory cards as well.